If there are two things that my 6 year old loves, it’s Pop-Tarts and Nutella. She’s super picky when it comes to food and super tiny, but I have absolutely no doubt that if Kellogg’s were to ever start producing Nutella Pop-Tarts, she’d inhale an entire box in one sitting. 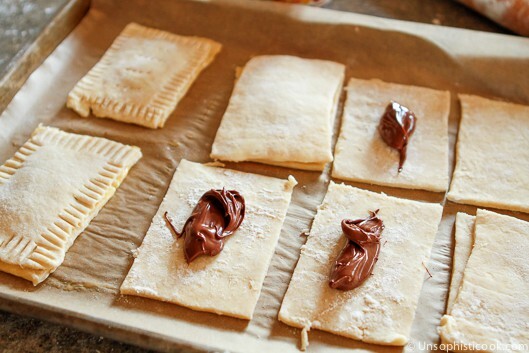 But alas, there is no such delicacy available right now… And so I was inspired to try making our own toaster pastries filled with ooey, gooey Nutella! While you could certainly use a store bought refrigerated dough like I used with my cherry hand pies, I opted to make my own pastry dough this time around. After reading that adding apple cider vinegar to your dough results in a flakier crust (apparently it prevents the formation of gluten), I decided to add two teaspoons of it to my favorite recipe. Result? It totally worked! The pastry crust was sooooo light and tender — totally worth the extra effort to make it by hand. Be sure to let the dough chill for at least two hours before rolling it out. 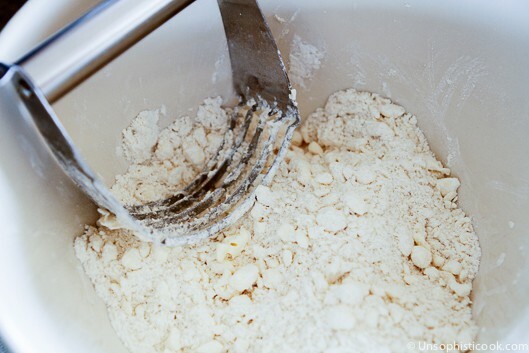 This allows the dough to relax, and it will roll out far easier when it’s cold. And don’t be afraid to use plenty of dough for rolling it out. You don’t want all of your hard work stuck to the countertop! 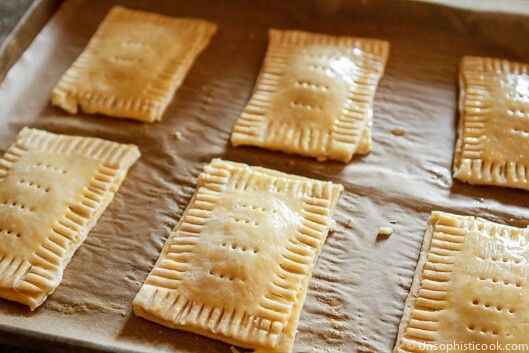 Don’t worry about being too precise when cutting out the rectangles for your toaster pastries. I think the irregular, rustic look just adds to their charm. After cutting, filling, and sealing the toaster pastries, the final step before baking is to give them a quick brush with an egg wash. This adds a bit of sheen to the final product and gives them that lovely toasty brown color. You could also give them a sprinkling of coarse sugar at this point, or give them a dusting of confectioners’ sugar after they’ve baked and cooled a bit. I opted to just leave them simple and plain though. Although I really can’t imagine it, if you don’t like Nutella, you can easily swap in your favorite preserves instead! My daughter gave these homemade toaster pastries a “thumbs up” — that’s a big kudos from her — as did the rest of the clan. 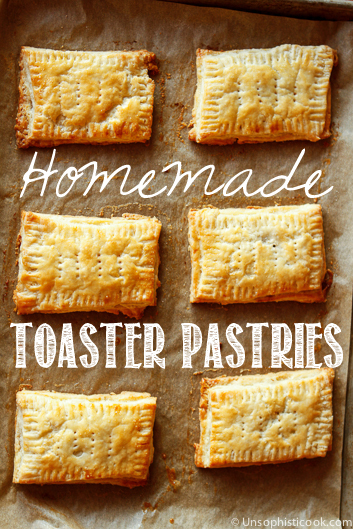 While this breakfast isn’t as simple as picking up a box of Pop-Tarts at Walmart and popping them in the toaster, they’re perfect for a weekend breakfast or an afternoon snack! I am going to use this recipe to make blueberry hand pies. Cannot wait! Thanks for the tip to use apple cider vinegar. Try it with Cookie Butter from Trader Joes! We make a version of these all the time with tons of different fillings and freeze them for an quick breakfast. Cookie Butter is the favorite, and nutella is a close second. Mmm, we will try it! Oh, I saw these running around Pinterest – they looked so good! These are amazing, Tara. Takes me right back to childhood! Yeah, I guess you’re probably right, Bethany. Either way, they’re delicious! These were fabulous! Thanks for the great pastry recipe! Will try other fillings soon! The pastry looks so tender and flaky! my daughter will LOVE me if I make these. Wait…delete “if” and add “when”. :) Yum! LOL, I suspected as much, Paula! This looks so easy. I’ve been wanting to make homemade pastries like this for a while, but haven’t done it yet. Oh my goodness, these look delicious!!! I have got to make these for Little Buddy (and for me too!) for breakfast really soon!! !